Chandragiri is a small village and is well known for its beautiful fort also called as Chandragiri Fort. Once the capital of Vijayanagar Empire, Chandragiri is located very near temple town Tirupati about 12 kms. 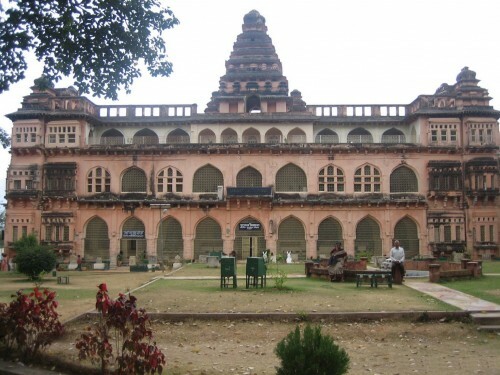 Chandragiri fort was built in the 11th century (around 1000 AD), and the greatest of South Indian emperors of Vijayanagara Sri Krishnadevaraya was brought up at Chandragiri fort, before his coronation at Penukonda in Anantapur district. Chandragiri was under the rule of Yadava Naidus for about three centuries and came into control of Vijayanagar rulers in 1367. It came into prominence during Saluva Narasimha Rayalu, he got the title of Mahamandaleswara and his illustrious Prime minister Chitti Gangarayalu (Ganganamatyudu) was known for his vision, wisdom and rectitude and was revered as a Bhisma Pitamaha in his times, he was the person who identified intellectualism of Timmarasu and taken him into the service of Chandragiri and later promoted to the Prime minister of Vijayanagar Empire.Gangaraya discendents served the Vijayanagara empire as trusted Generals and Governors for several generations, Chandragiri was the 4th capital of Vijayanagar Empire, Rayas shifted their capital to here when Golconda sultans attacked Penukonda. In 1646 the fort was annexed to the Golkonda territory and subsequently came under Mysore rule. It went into oblivion from 1792 onward. Since then, the fort grew in importance. Chandragiri fort is known for its securities. This fort was protected through an enclosed wall and a ditch which were used to act as a barrier for the attackers. The Raja mahal and Rani mahals on the ground floor of the fort. From the top of the fort, you can easily watch the whole town of Chandagiri which lies to the eastern part of the hill. The fort houses two major buildings - Raja Mahal (King’s residence) and the Rani Mahal (Queen's Palace). The main building is called as Raja Mahal, which is an impressive majestic three storied structure. The Raja Mahal palace is now converted into museum. The museum houses a small collection of ancient artefacts, idols and literature, related to regions ranging from Mysore empire to the Golcondas. The palace is an example of Indo-Sarcen architecture of Vijayanagar period. The central durbar occupies two storeys that are crowned by Dravida-Vimana. The roofs are supported by massive pillars in groups carrying cross arches with strong square ceilings, which are decorated with stucco figurines. The entire fort is constructed using stone and brick in mortar and is well plastered. The entrance of this mahal faces the hill on the north while the balconies and windows on the south overlooking the extensive grounds where perhaps the troops paraded. It is said to be the same venue where Sri Rangaraya granted the site of Fort St. George to the British in 1640. It is similar to the Raja Mahal in style and method of execution, this edifice with ground floor looking like a stable and first floor containing quarters adorned with ornamental sikhara has a flat roof. First and second floor of Rani Mahal is closed and kept out of bound from tourists. People say that this palace was for the queens but on contrary, the epigraphs say that this place was commander s quarters. This seems more obvious as the palace has a stable in its basement. A visit to Chandragiri fort would be incomplete without witnessing the light and sound shows that are conducted here at nightfall. In a whirling hypnotic motion, the two shows, one with a Telugu commentary, and the other, with an English commentary, wove pictures from a past that dwelt on the Chandragiri fort. There are regular buses from Tirupati where Chandragiri is just 12kms away. Driving in your own car or hiring a taxi is the best option.